A mixed country hedge is an excellent choice if you live in the countryside. Single species hedges can be ideal for year-round screening; dense evergreen species lend themselves particularly well for this purpose. These species, however, are often non-native and of little use to wildlife, as they tend to have a compact growth habit, which leaves no space for shelter or nesting, and produce little to no flowers or fruit. Hedges that consist of a single native (deciduous) species are generally more valuable to birds, insects and small mammals than hedges consisting of a single evergreen species are. Even better results can be achieved by mixing several native and deciduous species, which will create a longer and more diverse season of interest for wildlife and humans alike, with flowering in the spring and summer and berries in the winter. The best country hedges are able to fulfil several requirements. It is important that a country hedge forms a secure barrier to ward off unwanted visitors, such as cattle, as they often serve as a barrier between your farmstead and a neighbouring piece of land. 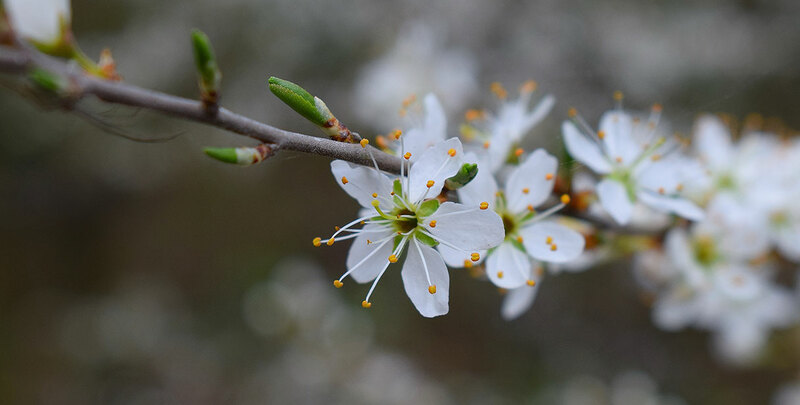 Furthermore, a country hedge should produce plenty of beneficial flowers or fruits (or both) and have a growth habit that allows animals to find shelter or a nesting site. From an aesthetic point of view, the species used should fit in with its immediate surroundings and the British countryside in general. Keeping all of these requirements in mind, an ideal combination would be a mixture of juneberry, hawthorn, cornelian cherry and hornbeam, which are primarily native species or species that are a good fit for Britain’s rural landscape. In a way, countryside hedges are the hedges that started off hedging altogether, as the first hedges were established around farmlands to keep unwanted visitors, often animals, from stealing or eating the crops. This began during the Neolithic Age, about 4,000 to 6,000 years ago. To this day, we still plant hedges around our gardens or farmsteads. Therefore, it is safe to say that the history of hedging is closely linked to the history of farming. While people would later discover the ornamental value of hedging plants and started planting hedges in their gardens solely for ornamental purposes, hedging remains an effective, completely natural manner of enclosing land and providing privacy. Often, garden hedges have the additional purpose of offering the garden owner privacy, which makes hedging plants with a dense, compact growth habit a necessity. For countryside hedges, however, the privacy factor is not as much of an issue. In fact, if a country hedge is too dense, it will not provide any shelter opportunities for birds and small mammals. Also, countryside hedges generally have a wilder, more informal look than most garden hedges, which are often trimmed into neat shapes. This is another advantage of a mixed country hedge; you can often let them grow without having to worry about maintenance too much. Especially if you have chosen to combine native species with complementary hedging qualities. Country hedges can be left (almost) completely unpruned, which results in a somewhat wilder look for your hedge. In urban areas, such an appearance would often be too informal or – even worse – take up too much space, as city gardens are often smaller than those in rural regions. It is possible, however, to clip your mixed country hedge into a neater shape if you prefer a more formal appearance. If this is the case, it is essential that you trim your hedge with regular intervals, as the hedge will become too bushy and large to be suitable as a formal hedge otherwise. However, country hedges are often planted as a boundary around a piece of land rather than for their appearance, in which case pruning can be kept to its bare minimum. That does not mean a mixed country hedge cannot be aesthetically pleasing though. In fact, the four species we have suggested above all have their beautiful aspects. Especially during the summer, when the blossoms of the juneberry and the Cornelian cherry are replaced by colourful berries that do not only look wonderful, but are also highly attractive to birds. This attraction to wildlife truly adds some value to countryside hedges. Regardless of how you choose to shape your hedge, it will certainly be easy to grow and maintain. Juneberry, Cornelian cherry, hawthorn and hornbeam are all quite resistant to pruning, but also respond well to being left alone. We definitely recommend mixed country hedging, as you can truly profit from the best hedging qualities of each plant this way. Of course, the aforementioned combination of hedging plants is not the only mixed country hedge worth considering. Blackthorn, lilac, dog rose, field maple and firethorn are all species that make excellent components of mixed countryside hedges, some of them because of the nesting opportunities they provide to birds, others because of their thorny branches that will certainly keep uninvited grazing animals at a distance. Mixed country hedging is often an excellent way to combine the beautiful appearance of certain plants with the functional qualities of others. In addition, these combinations make versatile hedges. They are often left unpruned to create a wild, informal look that is complementary to the British countryside, but if you do not mind regular pruning, it is possible to keep your mixed country hedge fairly formal.